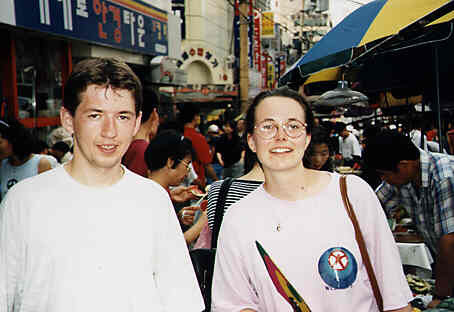 This is a photo of Robert Granc and his wife Hilda Sebesi at the Namdaemun market in Seoul, Korea at the time of their wedding as participants in the 360,000 couples Holy Wedding in August 1995. Hilda is from Romania. Robert is the author of the Hungarian Unification Home Page. To send mail to Robert Granc. Budapest 1085., Horánszky u. 19. I. 1.